Every year, the month of February is dedicated to raising awareness to the importance of good oral health for children. 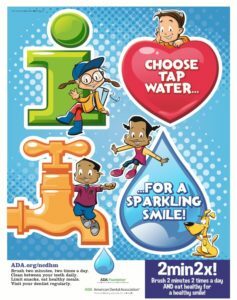 As National Children’s Dental Health Month, the American Dental Association and the ADA Foundation has focused this year’s topic as “Choose Tap Water for a Sparkling Smile.” As a family dentist in Parsippany, Rauchberg Dental Group supports National Children’s Dental Health Month by joining thousands of dental professionals to promote the benefits of fluorinated water to foster oral health in children. When it comes to promoting dental health in children, tap water provides a diversity of benefits. Among the most valuable benefit from tap water is fluoride. Fluoride is naturally found in water sources, including public water services. It is commonly added to public drinking water due to the dental benefits it offers. Fluoride is often referred to as “nature’s cavity fighter,” as it helps to build and maintain strong enamel. According to the Centers for Disease Control and Prevention, 19% of children have untreated cavities. Tooth decay is the most common childhood disease, making it more common than even asthma. While dental caries are frequently found in children, they are fully preventable. In addition to oral hygiene and regular appointments with the dentist, you can help to ward off cavities by having your child drink tap water. Fluoride helps to keep the enamel strong to stop the development of cavities. Not to mention, fluoride can also repair certain areas of the enamel that have become weakened. By restoring the enamel’s full strength, you will stop a cavity from forming. Tap water can help your child in other ways as well. We all know that sugary and acidic foods lead to tooth decay. By having your child eat a balanced diet and choose tap water to drink instead of soda or juice, you will further help to prevent tooth decay. You will protect your child’s teeth from damage, while ensuring they remain hydrated. You cannot rely on tap water alone to protect your child’s teeth from damage. They must brush their teeth twice a day for at least two minutes each session. For the best results, use a soft-bristled ADA-approved toothbrush and a fluoride toothpaste. In addition, children must floss their teeth daily using an ADA-approved dental floss. In addition to home oral hygiene, everyone over the age of two needs to visit the dentist twice a year for a cleaning and checkup. A routine cleaning will remove plaque and tarter accumulations that have been left behind with home oral hygiene habits. By performing a regular checkup, we can ensure your child’s teeth and gums stay healthy with prompt detection of dental problems for early intervention. Plus, we offer preventive treatments, such as fluoride varnish and dental sealants, to prevent cavities. At Rauchberg Dental Group, we encourage you to join us this month to help children choose tap water to promote their dental health. We look forward to seeing their sparkling smile at their next routine dental appointment.